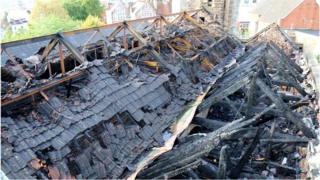 A Grade-ll* church which was badly damaged by fire last year is to be sold. St Michael on the Mount Without, in Bristol, had been boarded up since 1999 when it closed due to dwindling congregations. Much of the roof was destroyed in the blaze which was started deliberately; the building was already on Historic England's At Risk register. The Diocese of Bristol said it had a "wide open mind" over its future use. Canon Peter Robottom said other former churches in the city had been used for arts purposes and a circus school, after congregations had moved out. But he did not rule out it reopening in the future as a place of worship, as more people were moving back into the centre of the city.